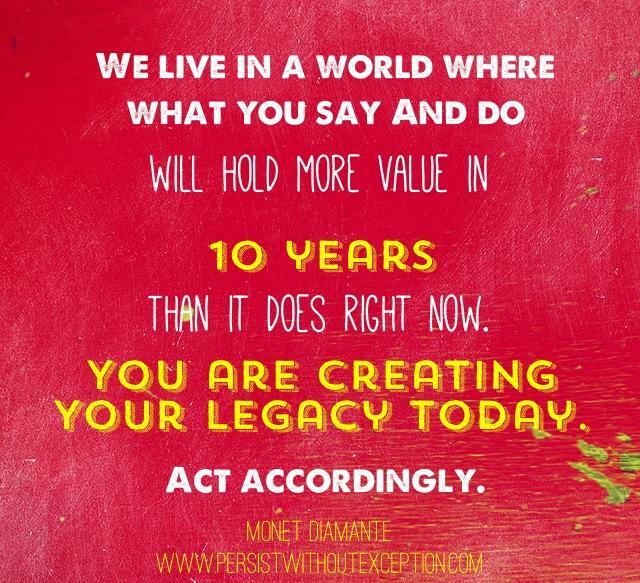 Monet Diamante | Create Your Legacy – The goal isn't to live forever. It's to create something that will. Of course you are correct, but I’m challenging you to think differently! Most people think about LEGACY as something you leave, not something you create. The reality is, we live in a world where what you say and do will matter more in 10 years than it does right now. And in 20 years. And in 30 years. You are creating your legacy TODAY. Whether it’s through what you post online, or what you do or say every day of your life. Some people might tell you to think about “how you want to be remembered”. And while this is part of it, it’s not all of it. This blog is about helping you figure out what legacy YOU want to create, to help you decide and act in a way that helps you create that. If you already know the answer, great! Do your loved ones? Your friends? Probably not. Why not speak it out loud? Read it? Write it down? Remind yourself of this every year, or few months, or DAY. In December 2012, I wrote a post on Facebook sort of saying goodbye to that year and ringing in the new. That post became my “Manifesto” (see above in photo). I wrote it down on a white board in my room and focused on it EVERY. SINGLE. DAY. I would even pick out one word – like GRACE – and focus on that one characteristic for a month until I felt it had become part of my core. The contents became my Core Values. Which led to decisions, actions, and ultimately the things I do every day that are creating how people will remember me. When I read this every morning, I found myself living to these standards in a more superior way, and 2013 went on to become my best year at that point. When you think about how you want to be remembered, not only does it help you have a solid idea for yourself, it also helps you make the right decisions to take the actions you need to execute to actually live up to that. A form of accountability, if you will. Not everyone likes to think about death. I find it exhilarating because it reminds me how important each day of my life is. I’d like to help other people switch to this mindset. It’s also a really sensitive topic that I think I’ve figured out how to address in a simple way. With the internet evolving, it’s more important than EVER that we respect the fact that we live in a world where what you say and do will hold more value in 10 years than it does right now. We need to know this, and we need to teach it to our kids and their kids. My vision is to teach everyone not just how to think of their legacy in this way, but to really come up with a statement – “My name is Monet and the Legacy I am Creating is XYZ…. and XYZ… and XYZ.” Can you imagine how powerful this will be for yourself, and your loved ones, and your friends, and the people you impacted, and the people you love, to have and to cherish forever, when it is your time to move on and leave it behind? Won’t it be interesting to see what people from all around the world say when figuring out their legacy? A legacy is a great way to see what someone values. I’d like to learn more about people from different cultures and how they view Legacy. In five years maybe you change your mind. Maybe you have a couple kids, and your focus shifts. I want this to be a resource for you so you can come back and remember what you said and allow your legacy to evolve with your life. It’s natural. What do you think? Do you know what legacy you want to create? Want some help figuring it out? Comment below or shoot me a message! Sidenote: I’m also trying to figure out how to update my website here and make it more extensive – I’m thinking a big map that’s geotargeted to wherever I am when I upload my legacy video – so if you know anyone that can help with that, I’d LOVE a recommendation! If you like this idea, please take a gander at my blog. You can also connect with or Follow me on Facebook for more here or on Instagram here and here. If you know someone who created an amazing legacy, I’d love to hear about him or her and maybe write a blog post about that person to share their contributions with more folks. If you know what legacy you are creating, what are you waiting for, shoot me a message, I would love to hear about it! Thank you for visiting – I look forward to connecting with you!